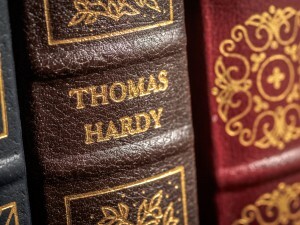 Committed to social justice, Thomas Hardy tired of London political talk, ‘of when the next election would be – of the probable Prime Minister’ (Hardy, Life and Work). He thought politicians were by and large ineffective and unconcerned about real welfare of the people, too prone to rushing through ill-considered and uninformed legislation – ‘The offhand decision of some commonplace mind high in office at a critical moment influences the course of events for a hundred years’ (Life and Work) and he believed novels were capable of bringing about deeper social changes. His own radical politics and acute class-sensitiveness are to be found in his fiction, from his treatment of the rural poor to his far-reaching interventions in the gender debates of his day. Hardy’s first novel, ‘The Poor Man and the Lady; By the Poor Man’, which he described as ‘socialistic, not to say revolutionary’, was turned down as too radical to publish, and when a version of it appeared as ‘An Indiscretion in the Life of an Heiress’ it contained an epigram from Thackeray’s Book of Snobs (1848) ‘Come forward, some great marshal, and organise equality in society’, from the passage in which Thackeray denounced ‘hereditary-great-man worship’ as a humbug and affront to the Free Press. It was crucial to Hardy’s politics to bring the regions to the centre, to give a strong and distinctive identity to the counties of Wessex, the ‘partly real, partly dream-country’ stretching from Land’s End as far north as Oxford, that he first named in 1874 in Far From the Madding Crowd. Through Wessex, Hardy would bring the plight of the agricultural poor to the attention of his London-centric middle- and upper-class readers, opening their eyes to the fascinations of a world outside their knowledge and experience, and challenging what he would call, in a piece he wrote for the popular London Longman’s Magazine in 1883 on ‘The Dorsetshire Labourer’, the view from the ‘Olympian heights of society’. Wessex also gave Hardy scope to expand on what lay at the heart of his politics – the individual differences that flourished away from what he saw as the homogenising tendencies of London and which for him were leading to such regrettable changes as the rural working class exchanging their colourful clothes for drab London fashions: ‘Like the men, the women are, pictorially, less interesting than they used to be. Instead of the wing bonnet like the tilt of a waggon, cotton gown, bright-hued neckerchief, and strong flat boots and shoes, they (the younger ones at least) wear shabby millinery bonnets and hats with beads and feathers’ (‘The Dorsetshire Labourer’). Like the philosopher and Liberal MP John Stuart Mill, for whom Hardy had the greatest admiration, considering his 1859 treatise On Liberty, particularly his chapter on ‘Of Individuality, as One of the Elements of Well-Being’, to be one of ‘his cures for despair’ (Life and Work), Hardy believed that the well-being of the country could be gauged by the number of people who were able to defy convention and think for themselves. Indeed, one of the reasons Hardy gave for returning to the South West was precisely that he thought his writing was becoming, as he put it, ‘mechanical and ordinary’ in the metropolis (Life and Work). Hardy was a self-declared Liberal. Siding with the marginal and oppressed, and lending public support to Liberal attempts to enfranchise the rural poor in the 1880s, one can speculate that, in today’s climate, he may have voted Green, given his commitment to the importance of place and environment and his life-long championing of animal welfare – ‘What are my books but one plea against “man’s inhumanity to man” – to woman – and to the lower animals?’ (William Archer, Real Conversations). At Exeter this week we are launching the Thomas Hardy and Clothing prototype online resource, which my PhD student Jonathan Godshaw Memel and I are working on in collaboration with Dorset County Museum, supported by current and recent Exeter students, including PhD graduate and Honorary University Fellow Dr Demelza Hookway (the database has been funded by the Annual fund). Clothing is crucial in Hardy’s fiction for indicating a character’s profession, social and economic status or role, for bringing colour to local scenes, for indicating moods and character, and for expressing but often subverting custom and transgressing gender norms. Bathsheba flouts Victorian convention, not least dress code, by not riding side-saddle in the opening scenes of Far From the Madding Crowd, when she also allows her hat to fly off, in disregard for propriety: ”It went over the hedge, I think,” she remarks. She is often associated with the colour red, which signals her feistiness – she wears ‘a rather dashing velvet dress’; on another occasion Hardy points out ‘the red feather of her hat’. 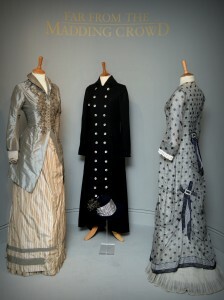 The database will show for the first time what such attire looked like and by whom it was worn, providing a further insight into the politics and social complexities of Hardy’s Wessex that continue resonant in the twenty-first century. When Far from the Madding Crowd was released earlier this month Professor Richardson appeared on the Today programme speaking about Hardy and the West Country. She also has a letter in this week’s Times Literary Supplement on Hardy’s politics. Professor Richardson is giving a public lecture on Hardy at Dorset County Museum on 28 May 2015 and a research paper on Hardy and the scientific imagination for the University College London Science and Literature Seminar Series on 2 June 2015.